The Alive! 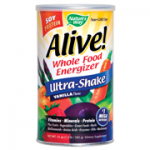 Whole Food Ultra Shake claims it will keep you energized and we pleased to find this to be true. 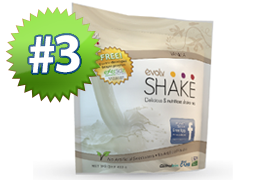 Put the energy drink down and pick up this meal replacement shake to get yourself going in the morning and throughout the day. Created by Nature’s Way, this green shake has a potent blend of fruits and veggies, providing you with more than %100+ RDA of vitamin A, vitamin C, vitamin D, vitamin E, zinc and more. Consumers should note though that this diet shake contains soy protein, which of course, countless studies have recently linked to an array health concerns. Likewise, Alive! 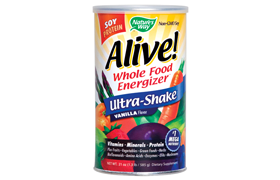 also has artificial sweeteners like fructose and maltodextrin. Perhaps it’s these artificial ingredients that give the shake, in our opinion, a strange taste. But to be fair, green shakes typically aren’t known for tasting great. However, one thing the Alive! shake has going for it is value. 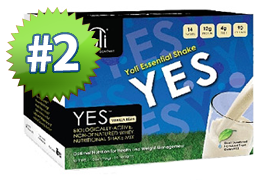 At only $1.73 per shake, it’s certainly a less expensive option compared to a lot of other products on the market. 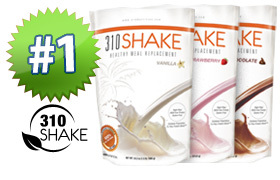 rated products on Shake Diet Reviews?